Next week I will resume the residue management topics. For this week, consider catching a UNL CropWatch podcast from Michael Sindelar, Extension Educator in Clay County. He interviews USDA-ARS scientists Marty Schmer and Virginia Jin who have conducted a great deal of corn residue baling research. You can listen to the podcast here: http://feeds.feedburner.com/NebraskaCropwatch. We haven’t traditionally had podcasts in CropWatch so Michael is focusing on this new effort. Dr. John Westra, Associate Director of Eastern Nebraska Research & Extension Center, awards Dr. Richard Ferguson with a plaque for his years of service. Center. We’re blessed with the high quality research that takes place there under the guidance of researchers, technicians, and staff with great longevity there. One of those researchers has been Dr. Richard Ferguson, Extension Soil Fertility Specialist since 1985. The past few years he has served as the Interim Head for the UNL Department of Agronomy and Horticulture, and I appreciated how he still responded to Extension questions! Effective January 1, 2019, Richard will be serving as Vice Chancellor for the Rwanda Institute for Conservation Agriculture (RICA). As vice chancellor, Richard will provide direction for the institution, manage fiscal resources, recruit and select faculty and staff, lead development of research and extension programs, and oversee student recruitment. Opening in July 2019, the RICA is an English language institution dedicated to educating and inspiring a new generation of innovators in agriculture in Rwanda. Establishing the Institute is a joint effort of the Government of Rwanda and the Howard G. Buffett Foundation, with the University of Nebraska–Lincoln providing leadership in curriculum development and technical advising. There is a farewell reception to be held on December 13 at the Goodding Learning Center (Plant Sciences Hall) on UNL’s East Campus from 3-5 p.m. You are also invited to share on the online guest book if you’d like at: go.unl.edu/ferguson-farewell. A special thank you to Richard for his years of service to Nebraskans and beyond and we wish him all the best in this new endeavor! 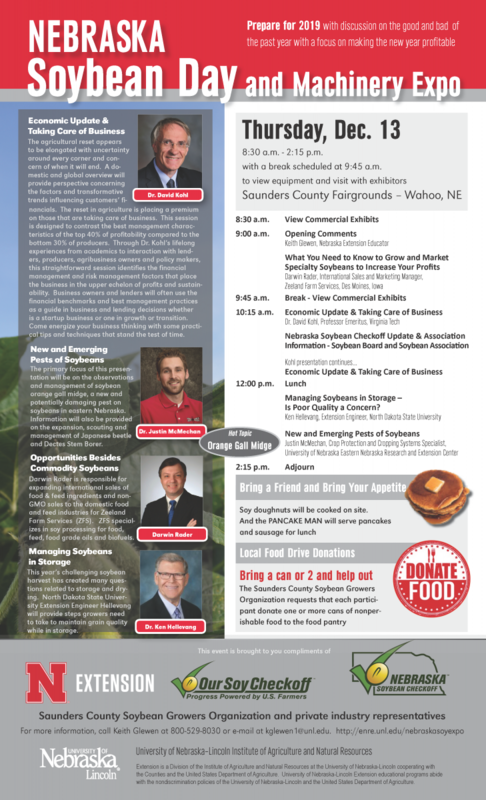 Nebraska Soybean Day and Machinery Expo: You may also wish to catch the Nebraska Soybean Day and Machinery Expo to be held at the Fairgrounds in Wahoo, NE on December 13. This year’s program has a great lineup of speakers with the program running from 8:30 a.m. to 2:15 p.m. Dr. David Kohl, professor emeritus of Virginia Tech University, will identify financial and risk management factors that place a farm business in the upper 40% of profits and sustainability with practical steps to move into that zone. During his presentation, “Economic Update and Taking Care of Business,” Kohl also will share a domestic and global overview on the factors and transformative trends influencing customers’ financials. New and Emerging Pests of Soybeans (primarily soybean gall midge) with Justin McMechan, Nebraska Extension crop protection and cropping systems specialist. What You Need to Know to Grow and Market Specialty Soybeans to Increase Your Profits with Darwin Rader, international sales and marketing management with Zeeland Farm Services in Des Moines. Managing Soybeans in Storage — Is Poor Quality a Concern with Ken Hellevang, extension engineer, North Dakota State University. Nebraska Soybean Checkoff Update and Association Information with representatives of the Nebraska Soybean Board and Soybean Association. Registration is at the door and includes a free lunch. For more information about the program contact Nebraska Extension Educator and Event Coordinator Keith Glewen at (800) 529-8030 or kglewen1@unl.edu. Attendees are encouraged to bring a can or two cans of nonperishable food items to donate to the food pantry. This program is sponsored by Nebraska Extension in the university’s Institute of Agriculture and Natural Resources, the Nebraska Soybean Board, Saunders County Soybean Growers Organization and private industry.